A new home voice service is here! Enjoy all the advanced features you want including High Definition sound, the ability to set up incoming home phone calls to also ring on your cell phone or office phone and now you can block annoying robocalls. As always, enjoy unlimited calling in the US, Canada, and Mexico. Are you a frequent international caller? Add the Simply Worldwide plan ($2.99/mo) to Telephone Premier in the cart for discounted per-minute rates on international calls. How much can Simply Worldwide save you? Find out below with our International rate calculator. Cox does not offer service in this zip code. Please check your location and try again. Wherever you go, the Cox Voice Everywhere app is ready to bring the capabilities of your home phone service along with you. Whether you’re making or taking calls or managing your home voice mail, your smartphone is now your key to taking your Cox home phone service everywhere. * International Long Distance calling is not enabled on the Cox Voice Everywhere App. Place a call on hold while you're already on the phone. You can also see the name and number for an incoming callwhen you're already on the phone with someone else. 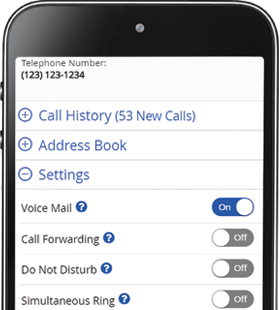 With Readable Voicemail, you’ll receive written transcripts of your voicemail messages to the email address of your choice or online..
See the name and number of the person calling on your handset and your TV! You can also see your incoming call history on your TV screen. When a number you call is busy, your phone can continue to attempt to connect for up to 30 minutes. You will receive a special callback ring when the line is free. Automatically send your address and phone number to emergency personnel during a 911 call. Call anyone in the U.S. and get unlimited calls to 30+ countries* when you bundle Voice with other services. Easily call the person who called you last. Talk with two other people at the same time. Forward all incoming calls and calls from select callers to another phone. Lifeline provides local, discounted telephone service for qualifying customers. This includes an FCC Access Charge waiver. You are eligible for the Enhanced Lifeline Telephone Service program if you live on Tribal land, or former Tribal land, as defined in 47 C.F.R. Section 54.400(e), which includes portions of the Oklahoma City area and all of the Tulsa area, and are a participant in any of the qualifying government programs OR qualify within the federally established annual income-based guidelines. Customer Care will determine if you qualify after eligibility has been determined. Qualifications for Oklahoma Lifeline are met if the applicant's total household gross annual income is at or less than the income maximums in the following table. The household meets all Lifeline eligibility criteria listed above. The household has a disabled member who has immediate and continuous access within the household to a TTY device or a Captioned Telephone (Captel) device. The TTY or Captel device is issued by DDTP or a medical certificate including the household member's need for the device is submitted to the Certifying Agent. Note: All Lifeline rules and regulations that apply to the first Lifeline shall apply equally to the second Lifeline provided to a household. Additional information regarding the California Lifeline Telephone program and services can be located online at californialifeline.com or at cpuc.ca.gov/PUC/telco. Go to the Nevada Lifeline Administration’s website at https://www.nvlifeline.org/ and follow the directions. In order to complete the online application, you will need to provide documentation showing proof of eligibility in one of the qualifying programs listed above. If you experience problems with the Nevada Lifeline Administration’s website, call Cox Customer Service at 855-213-1300. Cox will notify the NV Lifeline Administrator to mail an application to you. Return application and eligibility documentation to address provided. Contact us to request an application form. We will arrange for an application form to be mailed to you. It will arrive in a pink envelope for you to complete by a specific date that will be printed on the form. The application form must be completed either online or returned to the California Lifeline Administrator along with any required income documentation by the due date listed on the application form. Cox is unable to provide approval for Lifeline enrollment; eligibility is determined by the California Lifeline Administrator. The Nebraska Telephone Assistance Program (NTAP also known nationally as the Lifeline Program) assists qualifying low-income individuals with keeping telephone services affordable by lowering monthly service rates. Individuals can qualify for NTAP by participating in Medicaid, Supplemental Nutrition Assistance Program (SNAP), Children's Health Insurance Program (CHIP), Supplemental Security Income (SSI), Veterans Benefit/Survivors Pension Benefit, Federal Public Housing or if household income is at or below 135 percent of the poverty level. Follow the directions below. You will need to provide documentation showing proof of eligibility in one of the qualifying programs listed. Complete the online application and associated worksheet. Get all your questions answered before you buy. Yes, in most instances, Local Number Portability (LNP) allows a customer to change local exchange carriers and maintain their current phone number, even though they are now serviced by a different provider. Yes. Directory Assistance is available with Cox Voice service. Yes. Or if you choose, the information can be kept private for a small monthly fee. Can I make a phone call and watch TV at the same time? Yes. In fact, you can also be surfing the Internet with Cox High Speed Internet. Cox's broadband network allows you to use multiple appliances simultaneously. What makes Cox Voice better than its competitors? Cox Voice is provided over an upgraded digital fiber-optic network that has made Cox first in reliability. Our state-of-the art technology assures you of crystal-clear connections and, to keep your phone service trouble-free, we monitor the network 24 hours a day. Cox Voice gives you superior quality HD voice and features like robocall block and video calling. Will I have to buy a special phone for the new service? No, the phone working with your current service should work with the Cox Voice service. Cox utilizes the same type of switching equipment and software as other phone service providers. Will my house have to be re-wired? Usually not. There might be a time when our customer wants an outlet in a place that is not pre-wired or there is a problem with the existing pre-wire but this is the exception, not the rule. Where can I find residential regulatory information? You can easily access any Cox telecommunications service supplementary information you need here. *Call anyone, anytime in the U.S., Canada, Mexico, China, Hong Kong, India, Norway, the European Union (Austria, Belgium, Bulgaria, Croatia, Republic of Cyprus, Czech Republic, Denmark, Estonia, Finland, France, Germany, Greece, Hungary, Ireland, Italy, Latvia, Lithuania, Luxembourg, Malta, Netherlands, Poland, Portugal, Romania, Slovakia, Slovenia, Spain, Sweden, United Kingdom) and U.S. territories (Puerto Rico, U.S. Virgin Islands, North Marianas/Guam, American Samoa). Includes calls to Mexico that terminate on mobile phones for no additional charge.